The Irish football team has received some fierce criticism in the Republic of Ireland after a series of poor displays. Debates have raged in the pub or on television over who is to blame; the manager Trapattoni or the choice of players available to him. One thing is for certain, out of a poor squad, Everton have three gems available to represent the Irish national team, and the most notable is Seamus Coleman. Welcome to the first blog from one of our new team of writers. Ronan hails from Ireland and has been living in England since 2005. A Blue for over 25 years, Ronan has a passion for Everton Football Club which will come through in his writing. Please use the comments box to leave feedback and debate the article. It was surprising to see Trapattoni sitting in the stands of Goodison recently, particularly as he is not known for visiting games to watch perspective players. I guess if Darron Gibson won’t answer his phone or texts then you have to go and find him. Gibson is a dependable, consistent performer, who brings positive possession football to Everton. It’s a real shame Gibson is always prone to injury. When he is in team, Everton rarely lose. Gibson retains the ball so well, but his main attribute in my opinion is his ability to play a ball forward rather than back to his centre halves. He is always looking to go forward. He reminds me a little bit of Michael Carrick, who has an abundance of critics but he rarely passes the ball backwards. I’m not saying they are the same player but they hold similar attributes. I can only think back and remember watching Jack Rodwell and all the hype that surrounded him. He reminded me of a young Jermaine Jenas, passing the ball sideways and backwards, never forward. I do feel sorry for Jack though as the expectation placed on him was unfair. He was young and still is. Perhaps it was a past problem with the coaching at the club, evidently not so much anymore. Ross Barkley is a prime example. Forward passing; there’s a lot to be said for it. It’s a real shame Gibson won’t play for Ireland but it’s great for Everton. 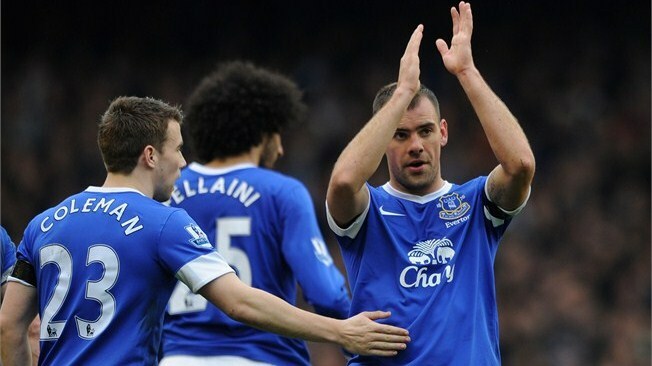 A fit Darron Gibson is of huge benefit to our midfield and his link up play with Seamus Coleman is fantastic. Coleman is an incredible talent and I was surprised Moyes didn’t make a cheeky bid for him, especially with the injury to Rafael. I do feel that Moyes will return for Coleman one day, as it’s a well-known fact that both he and Phil Neville rate him very highly. You might think I’m getting a little carried away here, but Coleman is class. His energy, commitment and drive to succeed are incredible. Back in Ireland, Coleman faced rejection early on in his career, but was determined to prove he was good enough. There are numerous supporters who will say he can’t defend but I disagree. He made multiple saving tackles last season, bailing out our centre halves on several occasions. He has improved the right hand side of the team no end. It has been the weakest side for years. Tony Hibbert is a good defender but I have always found him very frustrating to watch. He is poor when in possession and too willing to punt the ball long. Coleman will achieve great things in his career and I certainly hope it is with Everton. Both he and Gibson have a positive influence on the team to attack and Martinez has identified this already. I’m sure the young full backs like Ben McLaughlin and Ty Browning will look up to a player like Coleman and try to emulate his success through hard work and determination. Coleman is a likeable lad with his feet firmly on the ground; the perfect role model for any young footballer. The addition of James McCarthy is a good signing, and he should easily slot into the way we play football. I haven’t watched too many Wigan games (for my own sanity) but I have seen him play for Ireland lots of times (That doesn’t help my sanity either). He is a good footballer, who keeps himself busy in the midfield, always looking for the ball. He has been unfortunate not to have another player of similar quality alongside him in midfield at international level. I’m looking forward to the game against Chelsea and I hope Martinez throws him straight into the team. The fact that McCarthy and Coleman are good friends off the pitch will no doubt help him settle quickly. Time will tell if McCarthy was worth £13m, but in today’s transfer market that’s what you have to pay. What of Shane Duffy’s future at the club? I think he needs to get out on loan as soon as possible. He needs to do what Coleman did. Unfortunately I can’t see who he would replace in the team at present. When he covered for the centre halves a couple of seasons ago due to injury, he did reasonably well. Distin rates Duffy highly and that’s quite the compliment from the big French man. Duffy is way down in the pecking order, and with Stones, Heitinga and Alcaraz next in line, I don’t see much of a future for him. Perhaps I’m writing him off too quickly? This is the largest contingent of Irish players in the Everton squad since I can remember. The last two were of course the great Lee Carsley and Kevin ‘Zinedine’ Kilbane. How I cried when we signed Kilbane, but in the end, I guess he played a few decent games (About 5 to be honest!). How I hoped he would emulate the amazing Kevin Sheedy; how wrong I was. Now Kevin Sheedy, what a player. I only wished I could have seen him play live when I was younger. Exciting times lie ahead for Everton and hopefully with a few kisses on the Blarney Stone, these three Irish players can help us break into the top four. Would you be bothered about being involved with the manager who made that happen? In any case, it looks like Trap will get the sack soon, and you have to hope that the new manager can actually use these players properly, instead of that rigid 4-4-2 that’s been a hallmark. Very good blog Ronan…..especially agree about Coleman, our most improved player over the last year. Had my doubts about him defensively, but have full confidence in him now. He can become as good as Baines.